Disclosure: I received a complimentary e-book copy of this book and have volunteered to share my review. Back in high school, Lee Archer had the power to make Jessie Baxter’s cheeks flush and her heart race. But the popular athlete never wanted to be more than just friends. Ten years later, after a failed marriage and with her journalism career on shaky ground, Jessie’s come home for her high school reunion–and Lee still has the power to make her knees weak and her pulse pound. Lee’s teenage years were filled with more trauma and drama than anyone guessed. Though his damaged past has helped make him a successful police detective, it’s hurt every relationship he’s tried. But seeing the grown-up, stunning Jessie might just change his commitment-phobic mind. Jessie’s psycho ex-husband had her convinced no one would ever love her, but Lee is ready to step out of the friend zone and into her heart. Can she learn to trust again before she loses her chance to turn her first crush into her last love? Elizabeth McKenna’s novel will have you remembering the angst of high school, the grief of a failed relationship, and the joy of finding true love at last. First and foremost, there was a note from the author that advised of trigger warnings. The warning consisted of attempted suicide (minor character), drinking, homosexuality (minor character), AIDS (minor character), and abuse. The heat level is fairly low with only a few love scenes. There is also some swearing, including a few F bombs from one character. Having lived through most of that myself, I felt that the trigger warning was a nice notice, but they weren’t severe in my opinion. So pending you don’t have any underlying, severe issues with any of those triggers – this book will be fine to read. With that said; I am pretty sure part one (up until Jessie got into a real relationship) could have been my life. I had that first crush from 5th grade through senior year. This book was different than other books I normally read. I usually read the happily ever after romances that are hot and heavy with steam and is quick with the romance or the mystery/thriller/suspense type reads. This was neither and it was a nice change of pace from my usual. I really enjoyed reading the book. The topics were heavy, the emotions were real, and the romance was heart warming. I felt it was a quick read and read it in less than 24 hours and I would definitely read this book again. It wasn’t the unrealistic romance that I am accustomed too, but really hit real life and was a great read to escape life for a little bit. If you enjoy the more real life romance, following someone’s journey through life, and are looking for a good read; this is it. Though Elizabeth McKenna’s love of books reaches back to her childhood, she had never read romance novels until one Christmas when her sister gave her the latest bestseller by Nora Roberts. She was hooked from page one (actually, she admits it was the first love scene). She had always wanted to write fiction, so she combined her love of history, romance and a happy ending to write Cera’s Place and Venice in the Moonlight. Her short story, The Gypsy Casts a Spell, is available for free on her website here. 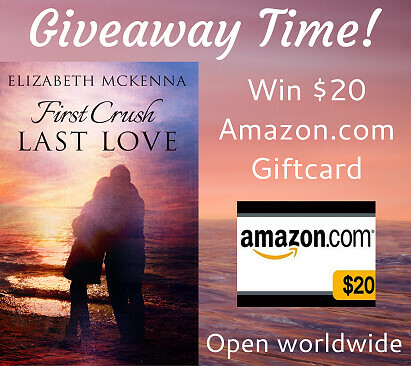 She hopes you will enjoy her first contemporary romance novel, First Crush Last Love, as much as others have enjoyed her historical romances. Elizabeth, aka Maureen Lippert, lives in Wisconsin with her understanding husband, two beautiful daughters, and a sassy Labrador. When she isn’t writing, working, or being a mom, she’s sleeping. Thank you so much for reviewing my book. I'm so glad you liked it!